One of the most important challenges in robotics is to achieve natural and engaging interactions between humans and robots. Interpersonal interaction, the process by which two or more people exchange information through verbal and nonverbal messages, could be exploited by robots both to establish interaction and to inform about its quality. 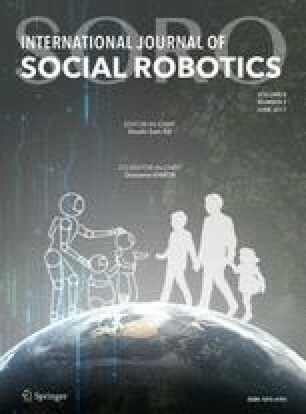 The production of social signals being influenced by individual factors, such as personality traits, is critical for robots to have personalized models of interaction. This paper focuses on estimating social traits such as human personality from the dynamics of interpersonal interaction. The work was carried out in the framework of the project engagement during human–humanoid interaction which focuses on understanding individual factors influencing joint human–humanoid actions. In particular, this work addresses the automated prediction of the Extraversion trait during a human–humanoid interaction. We show how it is possible to take into account the specificity of human–robot interaction scenarios by contextualizing personality through the attitude that participants show towards the robots. This attitude is influenced by the a priori knowledge that people have on social robotics, and their prior anxiety in interacting with them. The proposed model exploits a set of nonverbal features chosen according to literature in Psychology and Personality Computing. These features are adopted to characterize human behaviors and the dynamics of human–robot interaction. Experimental results highlight that it possible to predict Extraversion of the human partner from nonverbal behavior during human–robot interaction with an accuracy of 62%. A higher accuracy, 70%, is obtained from the computational model by explicitly combining the dynamics of interpersonal interaction and the attitude of the participants towards the robots. Results show that 120 s are needed to obtain such performance. This work was performed within the project EDHHI of Labex SMART (ANR-11-LABX-65) supported by French state funds managed by the ANR within the Investissements d’Avenir programme under reference ANR-11-IDEX-0004-02. The authors wish to thank the EDHHI team for the fruitful discussions and help in the experiments. The work was partially supported by the FP7 EU projects CoDyCo (No. 600716 ICT 2011.2.1 Cognitive Systems and Robotics). The authors declare that they have no con ict of interest. The experimental protocol used in this work (Ivaldi et al., ”Engagement during human–humanoid interaction”, IRB n.20135200001072) received approbation by the local Ethics Committee (CERES) in Paris, France.